An avalanche in the mountains of Indian-controlled Kashmir killed 17 Indian soldiers and injured 17 others near a popular Himalayan ski resort Monday. About 400 soldiers were training at the Indian Army's High Altitude Warfare School on the slopes near Gulmarg, some 35 miles west of Srinagar, the summer capital of Kashmir. 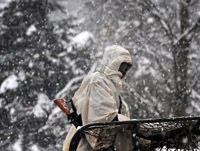 Heavy continuous snowfall hampered the rescue operation but all the missing soldiers were accounted for by late evening. Gulmarg is popular among foreign and local tourists for skiing and mountaineering during winter months between December and April. About 5,000 foreigners visited the town during the last skiing season, according to Farooq Shah, director of tourism for the government of Jammu and Kashmir, in Srinagar. Mr. Shah said local authorities had warned tourists of potential avalanches amid a heavy snowfall that has continued for three days. About 150 foreign tourists in the town are waiting for the weather to clear to go skiing, Mr. Shah added. The Himalayan region of Kashmir has long been a flashpoint of conflict between India and Pakistan since their independence in 1947. Both countries have heavy military build-ups in the part of the region controlled by them.